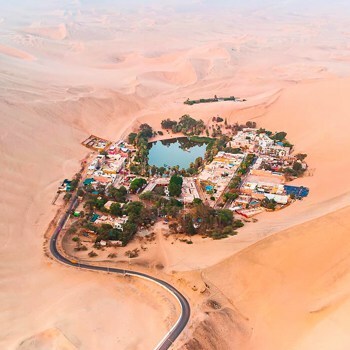 Huacachina Oasis Peru: Our detailed 2019 guide from how to get there, where to stay, how to sandboard on the sand dunes and more! 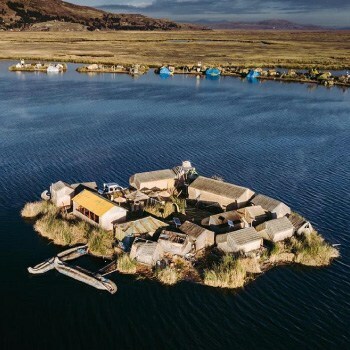 Located 4 hours south of Lima, close to the city of Ica. Huacachina is South America’s ONLY natural desert Oasis. Largest sand dunes in South America. Home of the best Dune Buggy and Sandboarding Tours in South America. How to get to Huacachina – Compare transportation options. 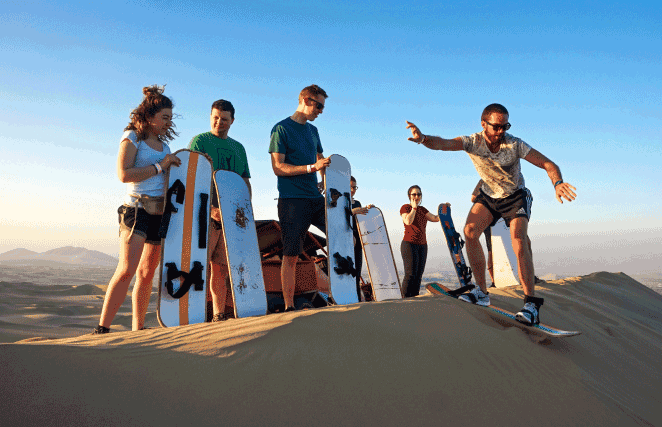 Must do in Huacachina – A list of the most popular activities for travellers. Must see in Huacachina – The sights you cannot miss. 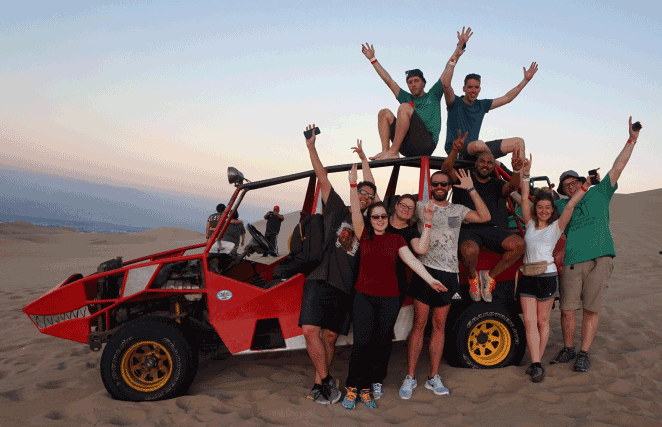 Huacachina safety tips – Safety issues to be aware of. Where to stay in Huacachina – The best hotel/hostel options. 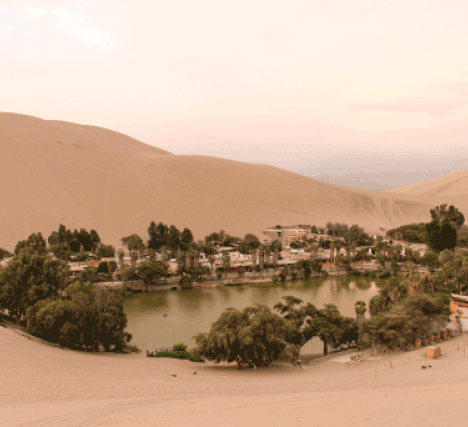 Photo Gallery – A few of the best photos of Huacachina. 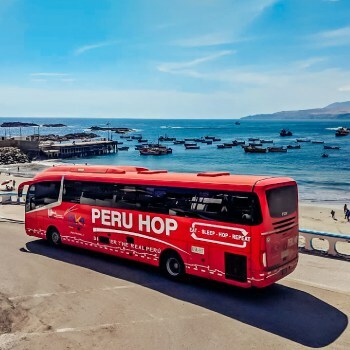 Peru Hop is the only direct bus to Huacachina, with buses going from Cusco to Huacachina and Lima to Huacachina, as well as from Paracas, Nazca, Arequipa, etc., saving you the hassle of taking a taxi with all your bags from and to Ica. 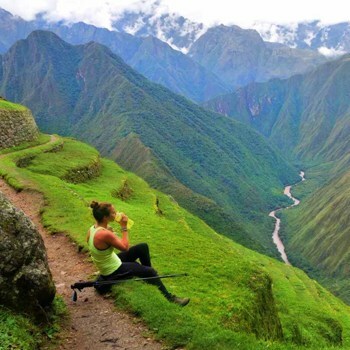 If taking a public bus, you would need to take a bus from Lima to Ica or Cusco to Ica. Once in Ica, you would need to find a local taxi to then take you to the oasis of Huacachina. To leave Huacachina, you would need to do the same. The Lonely Planet currently states that this is the only way to get to Huacachina, but actually Peru Hop buses have direct entry to the oasis, like previously mentioned, due to having the necessary license. Sandboarding and Dune Buggying in the sand dunes of Huacachina. Pisco Vineyard Tour (free Peru Hop tour). Walk around the city of Ica. 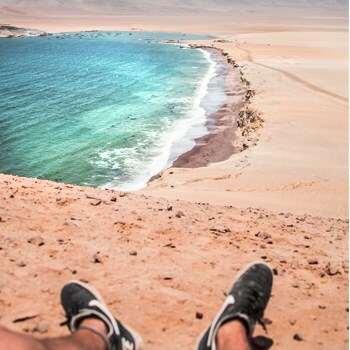 This tiny village is home to less than 1,000 local people, but every day fresh influxes of travellers arrive to do one of THE must-do activities in Peru… sandboarding down the famous Huacachina dunes! The local guides take travellers on a tour of these dunes on incredibly powerful (and safe!) dune buggies, flying over large humps in what seems to be a never-ending desert of sand. This in itself is awesome, but it gets even better as the travellers have the option to sandboard down some of these huge dunes! This can be exciting as well as nerve racking and often you will end up with a face full of sand but it’s nothing a quick shower won’t fix! 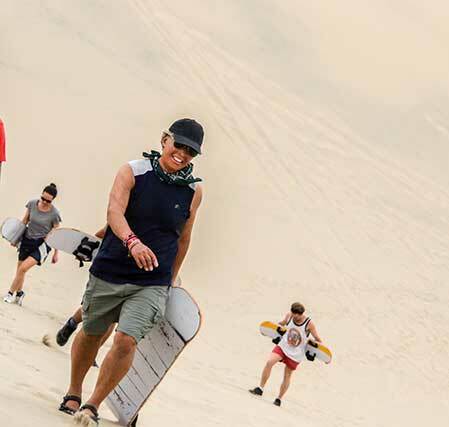 Snowboarding is world famous, but sandboarding is thrilling, faster and much much cheaper… an absolute must do for anybody who visits Huacachina. As well as Huacachina, Ica is also famous for its Pisco and wine vineyards. Pisco is the national drink of Peru, and Ica is often called the home of Pisco. We take you to a Pisco Vineyard tour where you will discover the history of Pisco, see how it is made, as well as getting to try a few samples of this deliciously refreshing drink. Peru is very proud of it’s Pisco and you simply cannot come to Ica without having a few glasses of Pisco! Visit the dunes in the late evening so as to see the sunset. The incredible view of the sunset from the sand dunes is one you should not miss if you make it to Huacachina. Climb up the dunes on foot or catch the sunset at the end of a dune buggy tour. Huacachina is very small, try to bring cash with you as there are NO ATM outlets. Bring sunscreen, it is nearly always sunny and hot. Beware of pickpockets and never carry your passport/credit card unless 100% necessary. If you take a public bus and get off in Ica, be VERY careful about what taxi you take to Huacachina. Many taxis in Ica have been known to take people to hotels that they have deals with, or try to scam tourists in other ways, so take extra care if you do have to take a taxi from Ica to Huacachina. 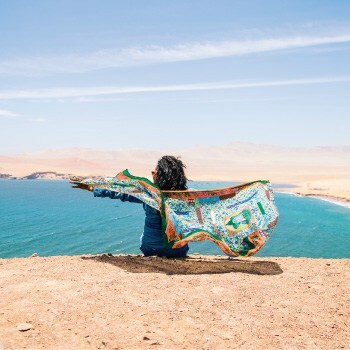 How to Book: Email huacachina@wildroverhostels.com and mention you’re a Peru Hop passenger. 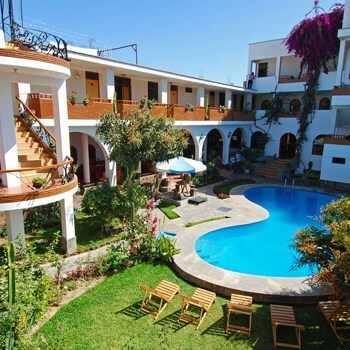 Description: Hostel accommodation with beautiful views of the oasis. Conditions: Must show Peru Hop wristband upon arrival.